I found this building while excitedly searching my new found obsession, the HABS/HAER database. Upon closer inspection the next day, I was able to find the remains of the foundation, which wasn’t that hard, actually. Notice the stairway in the bottom left corner of historic photo number 5. Same one I photographed. I tried to make photo number 2 and number 7 match up, though my photo is taken from closer to the former site of Blue Ribbon than the other. You get the idea, though. Also, notice the absense of a nice park in photo number 6, taken from a series of photos documenting the Northeast Corridor Railroad, dated, I think, sometime after 1968, but before the other photos in this series. The park (Roger Williams Memorial National Park), relative to the history of Providence, is new. It was authorized by Congress in 1965, took many years to landscape and develop, and did not formally open to the public until 1985. Prior to the existence of the park, the area was divided up by about 6 or so small lanes and all the lots were privately owned. The properties were acquired by the government, demolished and totally cleared to make way for the park. Photo #6 shows it in the “cleared” phase. RWMNP is the smallest National Park in the country. In Photo #6, the long rectangular building in the foreground is the Providence & Worcester Railroad North Freight Station. It was built in 1847-1848, back when the original train station was built (architect was famed Thomas A. Tefft). It was once a beautiful Romanesque building, but as you can see in that photo, it was definitely showing it’s age. It was still around until at least 1980, as it was in the National Register of Historic Places. We don’t know much about Blue Ribbon Beef Co… According to the HABS/HAER data sheets, more than one meat packing company was located over the river. Blue Ribbon was the last remaining meat packing plant on (over) the river in 1971. 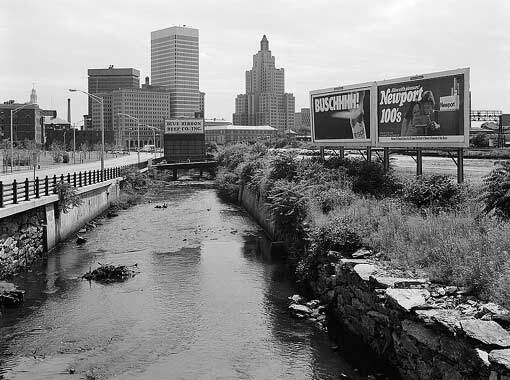 The Blackstone canal was designed to connect Worcester, Mass, and the Providence seaport. Construction started in 1824 and took four years, constructing a total of 49 granite locks. In 1832 a rail line opened from Worcester to Boston and made a quicker, cheaper route for goods to travel. In 1848 the canal ceased to be used for trade. Tom Sullivan (Jr) Jan 17 2010 I was surprised to see the view in picture 6. I did have fond memories of the building in the foreground, the Providence & Worcester Railroad North Freight Station. My father leased space in that building for the “Providence Philadelphia Despatch Co.” up to the early – mid 50s. Stephen Benjamin Jan 16 2010 I can add, that Swift and Wilson Meat companies were also over the canal. I used to work for Lincoln Packing which was on the site of where the RW Park site is. I worked there only one summer as a driver. But, I can recall being sent down Canal St to pick up some Franks from Saugy’s and anything else the Collagiovanni Bros needed for delivery. Built starting ? ?, demolished 1980s. Photos from Historic American Buildings Survey / Historic American Engineering Record, 1971. Originally located on North Main Street and Canal Street, across from Roger Williams park, Providence.